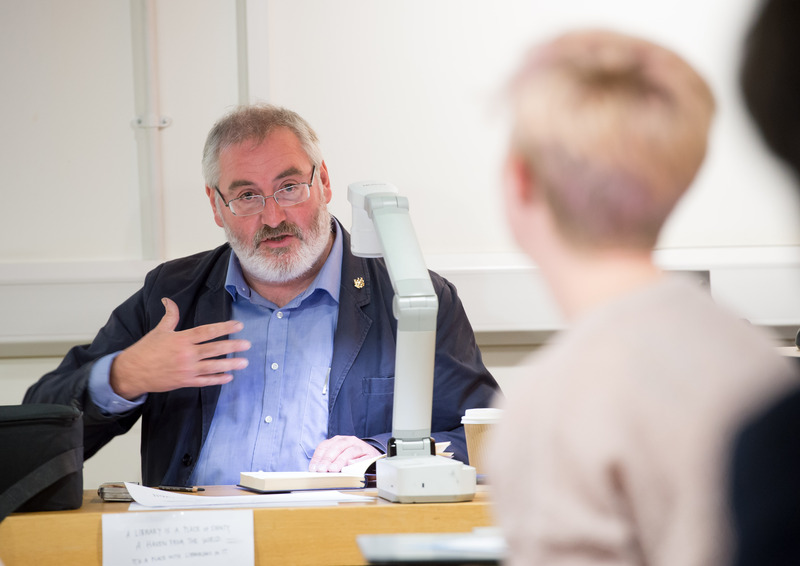 Brighton illustrator Chris Riddell visited the University of Sussex on Thursday 29 November with a busy day of drawing in the library. With an ardent passion for literature, Chris seemed right at home amongst the bookshelves and librarians, who were overjoyed to have their portraits sketched by the former children’s laureate. While treating students and staff to live projected screenings of his artwork, Chris reflected on his journey into illustrating, charming everyone with his charismatic wit and joyful drawings. The Observer’s political cartoonist praised The Badger for its name and recent political cartoons, whilst simultaneously transforming The Badger’s logo into Brian May. Chris’ light-hearted humour runs through his pencil onto the page in many of his drawings, especially as he tells entertaining stories of his eating ‘lumpy custard and stewed prunes’ for his school lunches. Typically drawing librarians as cliché cardigan-wearing book-worms, Chris was urged to come to the University of Sussex Library and draw real librarians. While the staff went about their morning, Chris studiously sketched away before welcoming students to hear about his influences and watch him draw some of his fondest memories. 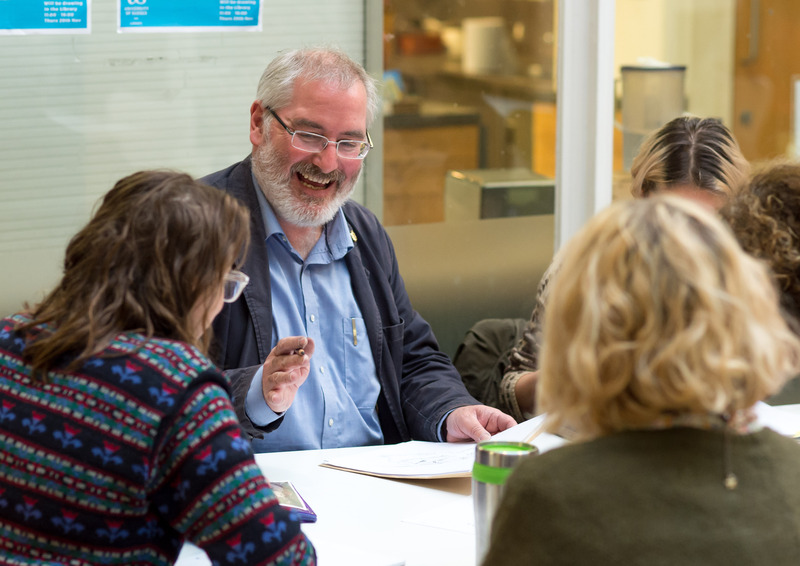 In the afternoon, Chris set up his projector in the Open Learning Space and welcomed questions as his pencil brought some of his fondest memories back to life. Although described as ‘disturbingly quiet’ at school, Chris spoke confidently at length of his most memorable moments growing up and throughout his career. Chris knew he wanted to illustrate from a young age, choosing to spend his father’s church sermons doodling instead of listening. He then nostalgically looked back at his Saturday job in Coulsdon Library, when he often snuck off to read instead of stacking the shelves. The pleasure he gained from stamping each book was clearly a key influence in his many depictions of librarians. He also joked that he got a kick from charging people around ten pence for their overdue books… thankfully a power he wasn’t granted during his visit to our library! Chris then turned to his first encounter with social media. As he began sketching a pair of jeans, Chris recalled a time five years ago when his wife had put his tossed-aside denim trousers in the washing machine with his phone still in the pocket! He said: ‘I hadn’t asked her to, I had just left them on the bedroom carpet… and then she came into my studio and said, ‘I think the washing machine is broken, it’s making this weird clunking sound’’. Of course, his phone was completely dead but, a blessing in disguise, it meant that he received a well-overdue upgrade from his provider – luckily they don’t charge ‘late fees’ like libraries! Once a shiny new smart phone arrived, Chris realised he had been using a ‘stupid phone’ all these years. The 56-year-old eventually got to grips with Facebook, Twitter, Tumblr and Instagram. Soon becoming fixated, Chris is now a self-confessed addict for ‘likes’, he told his audience as he drew the infamous blue thumb. He is frequently posting quick sketches and has a particular love for Instagram. To send him some virtual approval and enjoy his art on Instagram, find him @Chris_Riddell. Chris then turned to his collaborative work with children’s authors like long-time friend A.F Harrold as well as Simon Armitage, Neil Gaiman and Paul Stewart. He has also had the pleasure of meeting Carol Ann Duffy, whose work features in his recent poetry anthology, Poems to Live Your Life By. After showing off its shiny gold title, Chris read out a few of his the poems from his collection, including Phoebe Bridger’s lyrics from Smoke Signals, ‘a song about songs’ in Riddell’s words. The anthology also features work from Shakespeare, Byron and Kate Tempest. Each poem is bordered by Chris’ illustrations, which make for a beautiful visual accompaniment to the texts. The drawings are just as invaluable as the poems and evoke a sense of nostalgia for those familiar with his art in children’s books. One long-time fan reminisced of her favourite story Barnaby Grimes, written by Paul Stuart and illustrated by Chris, and asked who influences him. Chris responded with Arthur Rackham, illustrator of various Grimm fairy-tales amongst other classic stories, and William Heath Robinson, cartoonist of ‘crazy inventions’. Chris’ personal favourite of Robinson’s is an illustration of A Midsummer Night’s Dream, which taught Chris that ‘black and white illustration, in a sense, can convey colour’. He certainly justified this as he sketched out children’s character Barnaby Grimes, before kindly dedicating it to the honoured fan. The talented Brighton local then extended his generosity to the room in sharing his wisdom and advised everyone to ‘always explore your influences’, to be experimental and find your own style in any art form. He urged the aspiring artists in the room to ‘see what happens when you sort of free yourself up to just draw what’s in front of you’, assuring his audience that there comes a time when you don’t mind if your drawing goes wrong but that you should ‘own the mistakes’ and be proud of them. Chris’ own style is airy and fluid, capturing movement and expression within his work. He recommends creating a mood board of multiple influencers and channelling these different styles from memory into one of your own. Bringing the session to a poetic close, Chris read out his own poem titled ‘The Great Escape’. It is the only poem he has ‘ever written as an adult’ and ‘ever will write’. Consisting of three stanzas, the poem is a memoir of his childhood and school days, remembered in the solitary safety of his garden studio. Chris says he is ‘incredibly lucky’ to be an illustrator, whilst joking that one day he should ‘get a real job’. However, he is thankful to ‘draw for a living and then in order to relax I draw pictures’, enabling him to continue ‘having fun’. More than happy to ‘hang out in a library for the day’, Chris warmly invited fans to join him for lunch. For those who were not able to meet him on Thursday, some of Chris’ drawings from the day will be exhibited for a period of time in the library in the new year.